Smartphone Fanatics: Yes, No, or Maybe? Will HP webOS 1.4.5 Show Up This Week In the US? Yes, No, or Maybe? Will HP webOS 1.4.5 Show Up This Week In the US? 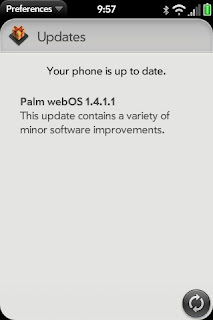 Despite the fact that Sprint may have posted the change log for HP's Palm webOS 1.4.5, US customers of the Palm Pre and Pixi still don't appear to have access to the update yet. Running the Updates application on my Sprint Pre gives me the "Your phone is up to date. Palm webOS 1.4.1.1" message and the official Palm webOS change log does not show any release notes for webOS 1.4.5. While the software update is not currently available today, as suggested by Sprint's release notes, it will likely be released in the next few days to a week if past history is any indication. So who wants to join me in a frantic game of Tap the Refresh button? Who Will Lead Apple After Jobs?